Introduction: A new social history developed in mid twentieth-century England, one that has seldom been taken seriously by historiographers of social history. The ‘history of everyday life’ involved disparate threads that are challenging to weave together: Arts and Crafts aestheticism, liberal citizenship education, and new teaching methods formulated for mass secondary education and popular heritage tourism. These threads can be united using the life and work of Charles Henry Bourne Quennell (1872–1935) and his wife Marjorie Quennell (1883–1972). 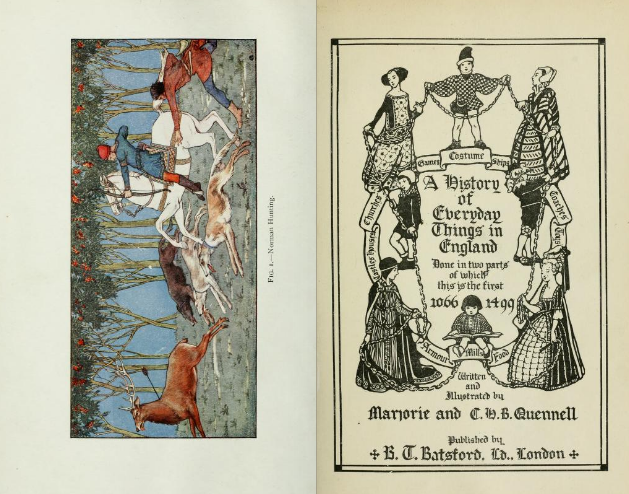 The Quennells were the authors and illustrators of a series of interwar bestsellers called A History of Everyday Things in England, which remained in print until the late 1960s. This article presents a close examination of the intellectual influences, networks of socialization, and practical activities surrounding these books. Its focus on the Quennells and the ‘history of everyday life’ opens an important window into the history of British social history. This episode has been little examined and poorly conceptualized, due to its ambiguous position between the decline of Victorian romantic and Whiggish histories and the rise of ‘history from below’ in the 1960s. The period between the wars has proven persistently problematic for scholars contemplating ‘the place of the past’ in English culture. Peter Mandler has traced the decline of the nineteenth-century ‘history boom’ to a point of fragmentation, bound up with disciplinary professionalization. Paul Readman has downplayed the impact of these changes, arguing that the 1890s and 1900s saw England’s ‘antiquarian sensibility’ deepen. The First World War ruptured the fabric of the cultural nation, and popular historical cultures between the wars manifested through a range of new, non-literary media, with the rise of broadcasting, cinema attendance, mass secondary education, and the democratization of museums. Modernization and reformist agendas gradually robbed the preservationist movement of the political and international urgency that ‘heritage’ had enjoyed in the late nineteenth century. This uneven landscape has not readily lent itself to precise estimations of history’s place in mid-twentieth-century culture. Raphael Samuel’s Theatres of Memory (1994), which championed the ‘unofficial knowledge’ of a people’s history, identified many instances of the ‘history of everyday life’, but did not argue that it was a coherent project with chronological specificity.